With a body length of up to 8mm, Steatoda bipuncta is found in many parts of England, but more abundant in southern counties. Females can be seen all year round, but the males are normally only seen from early summer to autumn. This is one of the spiders commonly known as a false widow spider. They're also sometimes referred to as Rabbit Hutch Spiders as they're frequently found inside rabbit hutches. The scientific name 'bipunctata' refers to the two indentations on the abdomen. 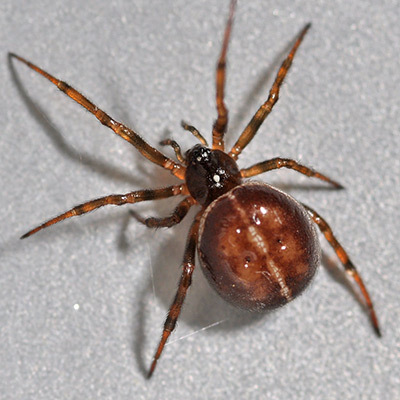 These False Widows are usually chestnut coloured, although some specimens can be lighter in colour. Frequently there is a line of tiny cream coloured dots running around the midline of the abdomen, and there is sometimes a pale line running along the top of the abdomen from front to back. The males have distinctively large palps. They are usually found around houses, sheds and out-buildings, including rabbit hutches. The web consists of a mish-mash of short, irregularly placed silk strands. When viewed from underneath this species has an unusual marking which looks like the 'Alpha' of the Greek alphabet.